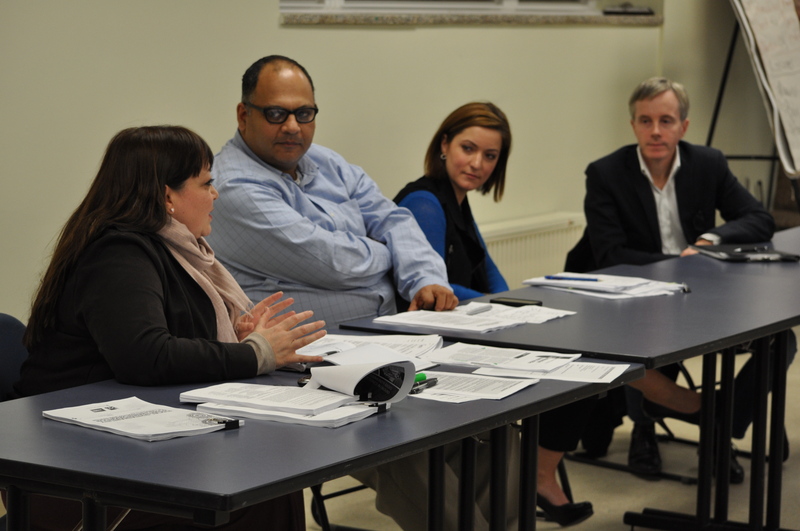 Wednesday night’s panel on speciality clinics — Natalie Mehra, Dr. Ahmed Bayoumi, Dr. Danielle Martin and Dr. John Lavis. Dr. Danielle Martin looks uncomfortable discussing the government’s recent plan to move hospital services into so-called specialty clinics. Ontario already has 939 independent health facilities; of which 904 provide specific diagnostic tests such as diagnostic imaging and nuclear medicine tests. The remaining 35 provide surgical or therapeutic procedures such as abortions, laser dermatology, and opthamology. Almost all of these independent health facilities are run on a for-profit basis. The government’s decision to have hospitals compete with independent health facilities for the right to deliver services ranging from cataracts to colonoscopies is among the most controversial ideas to emerge recently from the Wynne government. The Ontario Health Coalition recently completed a campaign that gathered more than 56,000 postcards expressing opposition to the plan. Doctors in rural communities are worried that losing these services could endanger local hospitals. Yesterday doctors in Midland said removing cataract surgeries from the Georgian Bay General Hospital and contracting it to a private clinic in Barrie or elsewhere could mean the end of opthamology services in the area. “Removing cataract procedures from our small hospital would impact allied services,” writes Dr. Martin McNamara, the hospital’s chief of staff, in a recent public letter to the LHIN. Doctors fear that this could be the beginning of the stripping of local services that could result in the demise of the hospital. Is it possible to be in favour of a more robust community sector without threatening the stability and scope of services at Ontario’s hospitals? Or do community-based services have to inevitably come from Ontario’s already struggling hospital sector? Wednesday night (April 9) the Medical Reform Group is hosting a panel discussion in Toronto on whether community-based specialty clinics can deliver better outcomes for patients, providers or the health system as a whole. Moderated by Dr. Ahmed Bayoumi, the panel includes Dr. John Lavis, Director-McMaster Health Forum; Dr. Danielle Martin, VP Medical Affairs, Women’s College Hospital; and Natalie Mehra, Director of the Ontario Health Coalition. While a regular meeting of the Medical Reform Group, others are welcome to attend this free event. To do so, please RSVP to medicalreform@sympatico.ca or call 416-787-5246. Space is limited. The Medical Reform Group is a voluntary organization of physicians, residents, and medical students committed to universal high quality health care for all Canadians. 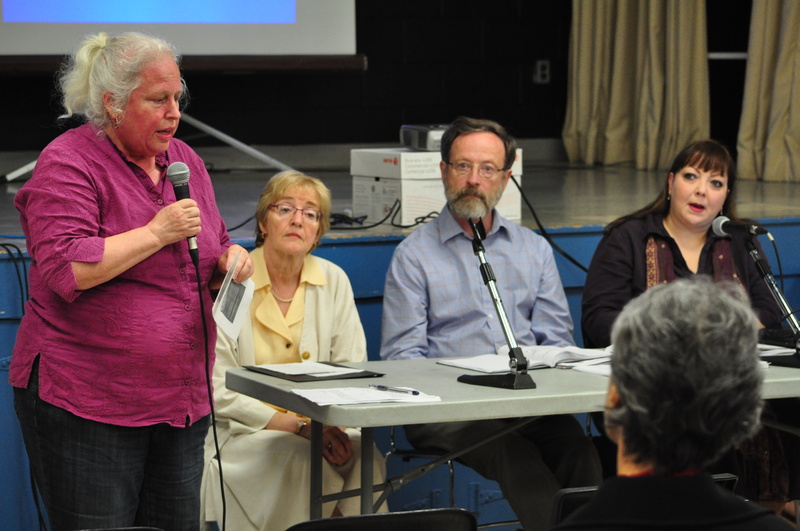 The panel discussion takes place Wednesday, April 9 between 7-9 pm at OPSEU’s Wellesley Membership Centre (lower level), 31 Wellesley Street East (across from the Wellesley subway station). Please be on time — doors will lock after panel begins. Was Monday really a tipping point? Honking for Health Care on University Avenue in Toronto. 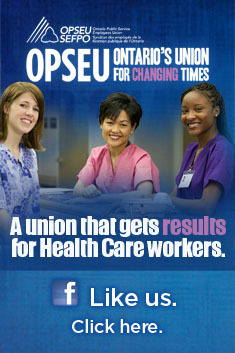 On Monday I saw Ontario Health Coalition Director Natalie Mehra at a noon-hour rally on University Avenue. As far as rallies go it wasn’t a big one. 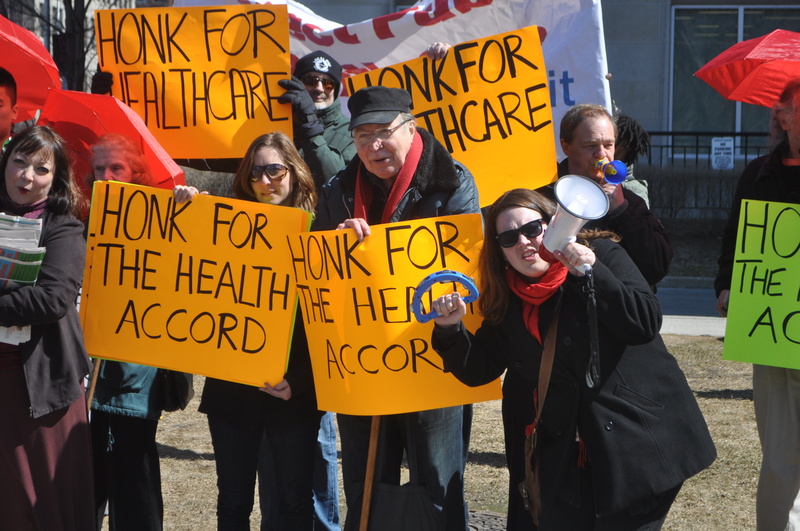 About 50 people showed up to hold up signs urging motorists to honk for a new health accord. So many motorists did just that it became, at times, hard to hear each other speak. Mobilizing people around the health accord is not the easiest sell. The health accord is a complex issue about planning, standards and funding. When you really strip it down, however, it’s really about the future of Medicare in this country. I was recently asked by a gas station attendant about a button I was wearing with a red umbrella and the text “Canada Needs A New Health Accord.” With customers waiting behind me I had to explain in 30 seconds what it was about. That’s not so easy and made me think if I found this difficult, what about a 10-second sound bite? March 31st we all were wondering if we just bit off more than we can chew. Mehra has been circling the province in recent weeks working on five regional campaigns intended to pressure the government to back off on a plan to contract selected hospital services to private clinics. 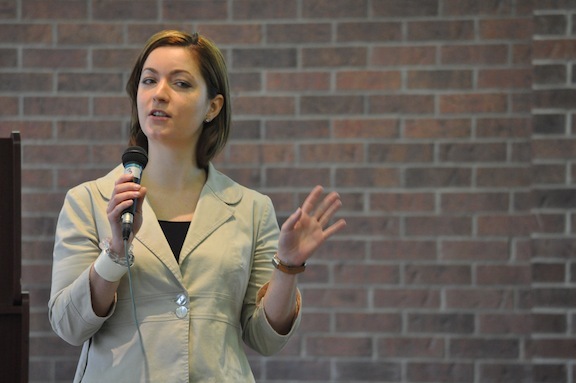 The campaigns are due to culminate this weekend in Windsor, London, Kitchener, Sudbury and Peterborough. Her enthusiasm has been infectious as she tells us of all the cards that have been collected to date. 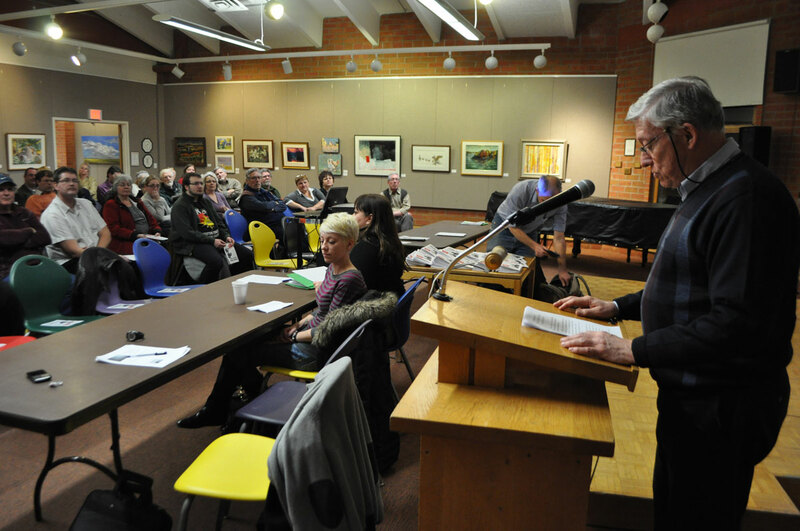 Carleton University’s Hugh Armstrong speaks about P3s in Kingston March 4. KINGSTON – As a Minister of the Crown, Kingston MPP John Gerretsen should know better. At yesterday’s anti-privatization rally in front of his Kingston constituency office, Gerretsen was steadfast in his assertion that the deficit rendered the government unable to build new hospitals without private involvement in the finance, design, construction and long-term maintenance of the building. The protesters are upset by the government’s plans to use a public-private partnership (P3) deal to build a new hospital in Kingston. The new facility will replace the aging psychiatric and rehab hospitals. At the same time, Gerretsen surprised the protesters by telling them he knew the P3 option was more expensive. The suggestion is that somehow using the private sector takes the costs of doing these projects off the government accounts. This is completely untrue. It’s a little like taking out your high interest VISA card as a solution to your debts. The Conference Board of Canada issued a report in 2010 funded largely by pro-P3 groups such as the Canadian Council for Public-Private Partnerships, PPP Canada and Partnerships BC. To say the report subsequently contains a pro-P3 bias is a massive understatement. Despite this, the report acknowledges that the idea of taking these financial obligations off-book has no value.